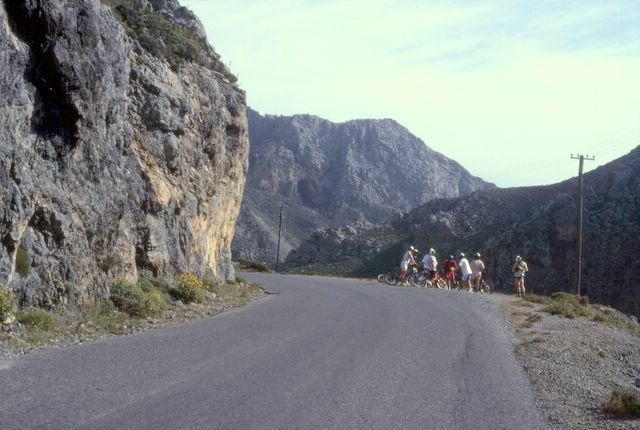 Information for walkers and cyclists Walk and Cycle in Crete . Crete is an island of contrasts and its interior is wild and rugged. The following tips should help all walkers and cyclists explore the island in safety. Take at least 1 litre of water per person for a days walking or cycling in spring and autumn. More will be needed in summer. Carry enough food to last all day in case you stay out for longer than expected. Do not continue through extreme heat in the middle of the day; take shelter until the day cools down. A broad brimmed hat, sunglasses and a total block sun cream are essential. Carry a small first aid kit and a whistle and know how to use both. Shorts do not provide any protection against thorny vegetation or sharp rock. They also cause offence if worn while visiting the churches, monasteries and other religious buildings which are all still in use. Do not go up on to the high ridges if they are covered in cloud or if strong winds are blowing. You need good visibility in order to identify your route. You cannot walk on a compass bearing. The distances given for the routes in this guide are the distances one way, between the two points. Some of the high mountain ridge walks are much easier to navigate in one direction. Take great care if trying to reverse one of these walks. Large scale maps are not generally available. Those that can be found in the shops miss out gorges and cliffs as well as most of the new tracks and paths while showing old paths that no longer exist. Make sure that someone knows where you are going, how long you are likely to be out, and what to do if you fail to return. Some of these routes in this guide have been explored on mountain bikes and some on foot. All are suitable for walking but the times given are approximate, based on how long it took the author who is reasonably fit but not in his first youth. He is always stopping to make notes and photograph flowers, wildlife, people and village scenes as most readers probably would, so his times should be a consistent guide. These are walking times and do not include lunch breaks, time spent exploring churches, ruined buildings, caves or other attractions.